Guar Gum Powder, also called guaran, is a galactomannan. It is primarily the ground endosperm of guar beans. The guar seeds are dehusked, milled and screened to obtain the guar gum. 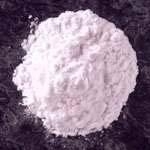 It is typically produced as a free-flowing, pale, off-white-colored, coarse to fine ground powder. Guar gum is derived from the guar plant. Cosmetic Uses: Guar gum is a natural thickener, emulsifier and stabilizer, and is widely used in cosmetics. Guar gum is useful because it has the ability to thicken without requiring heat. Its viscosity is a function of temperature, time and concentration. When combined with a saturated solution of borax and water, guar gum will form a gel. Recommended at a rate of .1 - .5% in most formulations. A little went a long way. It thickened good, but was a little lumpy, maybe something i did wrong.